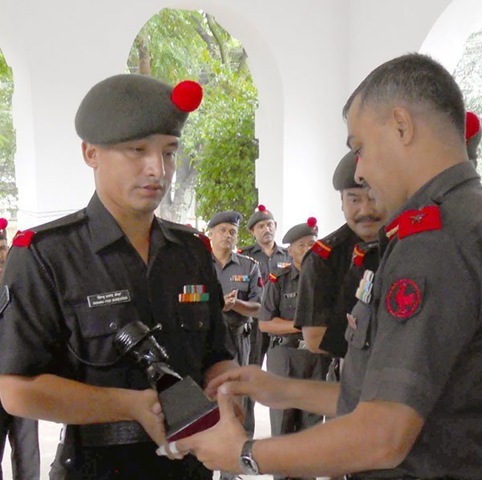 Bishnu Shrestha, a brave Gurkha soldier in Indian Army, defeated 30 train robbers while returning home after a voluntary retirement. The Indian army, is going to awarded Bishnu with Sourya Chakra, Bravery Award and Sarvottam Jeevan Raksha medals during the Indian Republic Day celebration on January 26 . While in the train, Maurya Express from Ranchi to Gorakhpur, on September 2, 2010, 35 year-old Bishnu saved a girl about to be raped by the train robbers in front of her helpless parents. After looting the train, when the robbers started to strip a 18 year old girl in front of him, he couldn’t contain his calmness. He took out his khukari and took on the a group of 30 robbers, alone. In the fight, he killed three of dacoits and injured eight others. Remaining dacoits fled the scene to save their lives. The police arrested the eight injured dacoits and recovered Rs. 400,000 in cash, 40 gold necklaces, 200 cell phones, 40 laptops and other items left by the robbers while fleeing the train. In recognition to his bravery, his regiment has given Bishnu a cash reward of Rs. 50,000 and it has also terminated his voluntary retirement, so that he could get a customary promotion after he receives the medals. In addition to that, he will also receive a cash rewards from the government, special discounts in international air tickets, and discounts in Indian railways train tickets. Updated according to a news in Indian newspaper Times of India of September 4, 2010. The report of Indian Army awarding Soury Chakra proved to be wrong as his name was not included in the official Indian Army site. This entry was posted in Event, facts and truths and tagged Gurkha. Bookmark the permalink. "It is better to die than to be a coward"
Well, what can I say? He’s the real RAMBO! Gurkhas are world renowned bad asses. Great Job sir, I salute you. I only wish this world had a lot of Bishnus! World would have been a better place to live. thank you again for letting the world know about what we stand for! Hey Gorkhas make the enemies (inside or outside the nation) swet due to fear as always. I also wanna be like him. I was talking about you this morning with my colleagues and also I show it on the web site and he so excited having seen your performance. It is an extremely high and outstanding job that you’ve done and thanks for making all of us proud. The opportunity was testing you and instantly you graved that despite being your own life endanger. What a wonderful job an exceptional undoubtedly, I think this is the most valued dignity you’ve achieved in your life time. ayo gorkhali ko 6oro .breavest people of the world r us the great gorkhas . you had made our ancestor’s chest from 50 to 80 . Proud to be Gorkha,bravest amöng the brave. Jai Gorkhali. hi brave hero Bishnu excellent duty you done this is a very exemplary sign.”SHINY EIGHT SHINY FIGHT”keep it up.timro ayu dherai hos sathai ramro health ko lagi bhagawan sanga prathana la.AYO GORKHALI DURGA MATA KI JAI.NARJANG GURUNG.8 gorkha rifles now at uk. Salute to fighting spirit of a brave soldier in a great human being…..
GREAT MAN !!! WELL DONE !!! Well done brave man !! You set great example of valour true to Gorkha spirit of fighting !